Look up from your phone or computer for a second. Everything's covered in darkness, right? Well, naturally, at this time of year, we're only graced with a few precious hours of gloomy light per day. That means everything around you is lit up by street lamps, the glow of smartphones and car headlights. In case you hadn't noticed, there's also hoards of flashing, retina-melting bike lights. If you live in a city, they're a necessity, of course — nobody wants to go unspotted as a bus turns into their path, or as a pedestrian walks through a cycling lane. However, while lights are often the first thing you pair with a new bike, most of us take a gamble on how well it'll actually perform with you on the road - simply picking a suitable looking option up in the shop or online. 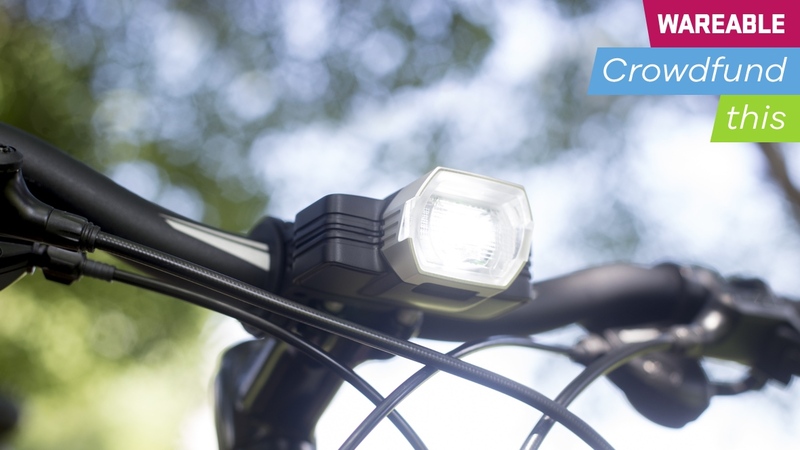 Looking to add some smarts to the area of bicycle lighting, though, is startup Binoreal. With its Radius F1, which has launched in two models on Indiegogo from $40 ahead of expected shipment next April, it's looking to keep cyclists safe through self-adjusting lighting. "There's an increasing number of cyclists, especially in the western countries, but also in Asia, where we're based. Of course, this means there's a vast amount of bike lights out there, as a result, and this is the first step for us to try and do something different," said Stefan Feustel, Binoreal's product manager and chief designer of the Radius F1. Doing it differently is a box Binoreal appears to have ticked, developing the Radius F1 to be speed controlled (where riding faster results in a brighter light and slower giving you dimmer), flash when you're braking to a stop, pulse when you're turning a corner and recognise inactivity in order to shut itself into standby mode. However, Feustel indicated that there's been plenty of challenges in getting the device ready for a crowdfunding campaign. "To put all this technology into a reasonable size and something that still looks good, that's obviously the biggest challenge in design," he said. "But you also have difficulties within that, such as designing the optics for the light. We're a small team here, and there's no real optics expert, so although this is area isn't rocket science we still have to do things like that for ourselves." Like with every new product going through development, lots of issues also cropped up both in testing and when surveying potential users. As a result of the latter, the company decided to scrap a design which would feature two different lights to create the light picture required, and also held back on making the device work with smartphones over Bluetooth. For control over the lighting, users can instead make use of the detachable Bluetooth remote which wraps around the handlebars. And in testing, Feustel noted that there were mechanical issues, too - particularly with the lighting patterns. "There's a lot of intricacies, such as the time you want between the transition from the braking-to-stop function. Initially, it was a bit annoying, because it would be a blunt on/off, kind of like a flash, so we changed that to a more smooth pattern." he told us. And it's these lighting patterns, when you really break it down, which separate Binoreal's Radius F1 from not only the standard bike lights in the market, but also the competition within smart safety lighting. After all, having a light that adapts isn't anything groundbreaking, but having a beam which doesn't jarringly switch between preset lighting options is far less common. So, Binoreal is offering you something a little bit different in the area of smart bike lights, but should you back the project? Well, while this is the company's first go-around in the crowdfunding space, it indicates that its device is ready to hit the production line, providing the funding goal is met. That's a positive, but, in our view, the bigger question is whether you want to spend this much money on a smart light. Safety is an area you don't want to skimp on, naturally, but there's also other areas to explore if you're a safety-conscious cyclist, such as smart helmets. All in all, Radius F1 is a simple product, which, given its smart lighting patterns, could quite easily become one of the better, smarter options that those in the market for a smart bike light could look into. Just make sure you delve into the rest of the growing field beforehand.